This makes me reaaaaaaaally happy!! You've got some REALLY good screen grabs! Amanda are those your sites?! lol. I wish they were! The first one's Liza's. She's an awesome friend of mine. The second one was a REALLY good one I magically found one day from Google. I think I'm the only one who knows about it because I've never seen those pics anywhere else. The third one's from a site that's mostly fanart and fanfic, and I go there a lot because I'm a member. There are lots of other sites I know about with TONS of screengrabs. I'll provide the links soon. Yeah, because I've never seen those sites. Or, in fact, any sites with a good Lion King screengrab collection. Thats why I was kinda inspired to create My Lion King...because I had a good program that could pull off screengrabs from the DVD. 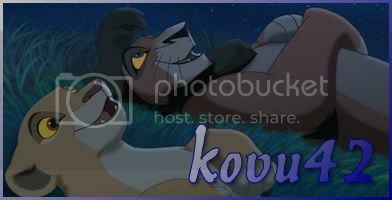 Which brings up another point: If anyone would like to request a certain screengrab, like how my avatar has Kovu looking like that - which was hard to capture by the way. Anyway if anyone wants to request a certain freeze frame from either of the 3 movies just tell me where to grab it from and I'll post it in the correct scene either in order or at the bottom of the page, probably.